80 eclipse images were taken during totality by means of a Canon EOS 5D digital camera equipped with approx. 1 m focal length lens. Unfortunately a lot of images were influenced by clouds and that is why the composition of all images in one resulting image was impossible. Finally 31 images were chosen. About 550 other images (dark frames and flat-fields) were used for eclipse images calibration. The resulting image shows not only the inner corona in the delicate details but also the lunar surface is recorded in a quality not very far from an image taken during the full moon. The position of the Moon represents the situation 139 seconds after the second contact, i. e. 03:30:58 UT (15:30:58 local time). Processing Composition of 31 eclipse images. 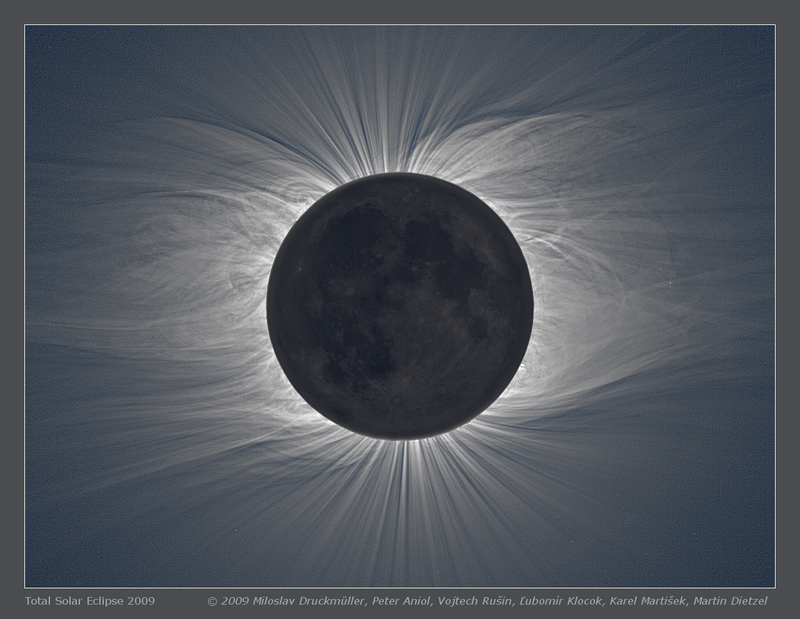 Eclipse images calibrated by means of dark frames and flat-fields, aligned by means of phase correlation, composed by means of LDIC 5.0 software, processed using Corona 4.1 in order to visualize coronal structures. Final processing was done using ACC 6.1 software. Orientation Image must be rotated 6.5° clockwise to achieve standard orientation i. e. North up.